I've been on a roll with my do-it-yourself videos. 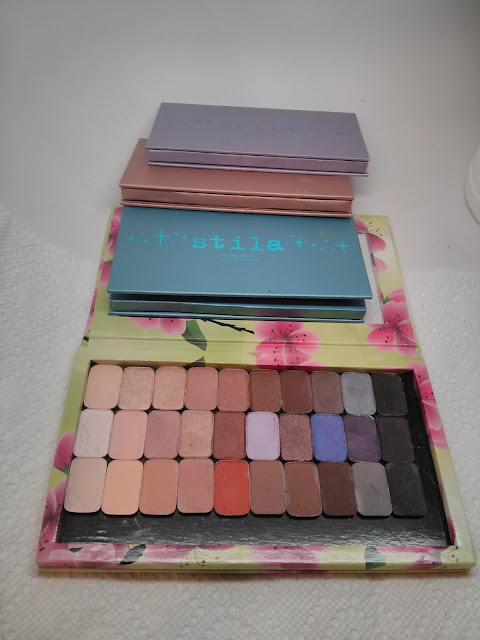 Today I'm sharing a depotting project which has allowed me to consolidate 3 stila palettes into one pretty, much more convenient z-palette. The video is great for any of you wanting to depot shadows into cardboard palettes with no heat. Check it out! 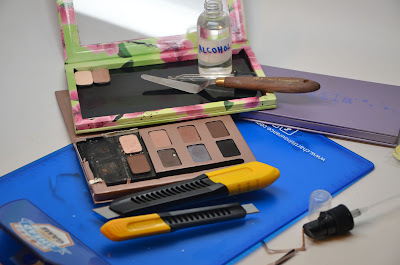 This process works for any makeup pans that are in a cardboard palette...i.e. Stila, ELF Encyclopedias, Urban Decay Etc. You don't need heat because the only thing holding the pan in is a bit of glue on a cardboard and foam surface. Z-Palette - the magnetized palette to hold steel pans. You may need the steel stickers that come with it as well. Lay out your paper towels, then your cutting board on top. Hold the cardboard palette firmly then make cuts around the eyeshadows in a square motion. Lift up the foam and cardboard around the shadow. Take your tear dropper with alcohol and put a few drops underneath the pan. Wait a few seconds for the glue to dissolve. Twist the pan back and forth in a flat motion to remove the pan from the cardboard. Never life straight up or the shadow will crack. If the pan doesn't life easily, slide your spatula underneath to help break the glue. Clean off the sticky residue from the pack of your pan with a cloth and adhesive remover. Check to see if the pan sticks to the magnetic palette - if it does then you're done. If it doesn't apply the adhesive steel sticker to the back. Take a label and pen to mark the name of the eyeshadow on the back of the pan if you'd like. That's it! Be careful as you're working with a sharp exacto knife. But I was able to depot 3 Stila Palettes with no casualties and it's much more organized and kit friendly now. If you are able to depot any of your cardboard palettes, send me a picture and i'll feature them in a post! Love it! Your depotting of the first Stila palette at least has made me want to check it out & get my own. I still haven't figured out on how to depot palettes with plastic. I think depotting the cardboard ones is easier. Thanks for the video.